It’s true. I really do. I’ve been a major proponent of the MOD (Made on Demand) format for DVDs ever since I first heard about the idea in the context of movies – “Want an obscure film from our vault released on DVD? We’ll print copies on an as-ordered basis!” – but when they started moving into doing the same thing for TV series, I practically lost my mind. Mind you, they eased into television, first offering up a bunch of TV movies, then miniseries, then a couple of more recent series that didn’t have massive fanbases, like “The Eleventh Hour” and “Dark Blue.” Soon, however, they started to delve into their back catalog of Hanna-Barbera series…and that’s when things really started getting interesting for me. Be delightfully miserable with the Addams Family as they take to the road in their Victorian-styled RV for spooktacular cross-country quests only they can conjure. From Nashville to New Orleans, New Mexico and Hawaii, these peculiar parents – Gomez and Morticia – treat their family to misadventures, including outwitting a band of gold thieves, freeing the animals from New York’s Central Park Zoo and racing a horse in the Kentucky Derby. They even win a piece of the moon and with Uncle Fester’s rocket, the trip will be a blast! You may remember them as “altogether ooky,” but the spirit of this family is contagious! 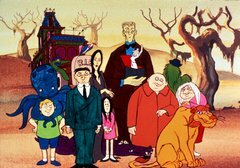 Although the “Addams Family” movies resulted in an animated series in the early ’90s, a lot of people don’t realize that there’d already been one back in the early ’70s. I remembered that I’d watched it as a kid, but I hadn’t seen it in years. Indeed, my only truly concrete memory of the ’70s animated version of the Addams Family came from when they appeared on an episode of “The New Scooby-Doo Movies.” Unfortunately, although John Astin, Carolyn Jones, Jackie Coogan, and Ted Cassidy contributed to the Addams’ “Scooby-Doo” appearance, they’re nowhere to be found on this set. This is the sort of disappointment you never really get over as you’re watching it, but at the same time, if you’re a fan of “The Addams Family” in general, then it still makes for relatively enjoyable viewing. Buzz Conroy is a heroic boy-genius who builds the powerful robot Frankenstein Jr. When the Ghastly Genie, the Junk Man and other evildoers get up to their old tricks, “Frankie” and his young creator crank into action. The crime fighting coalition continues with the Impossibles, a group of superheroes disguised as a beatnik rock group. At the direction of “Big D,” Multi Man, Coil Man and Fluid Man make hot-rockin’ musical justice thwarting thieves and corralling crooks with their transformative powers. This remains one of the oddest – and therefore coolest – series ever to have emerged from Hanna-Barbera. 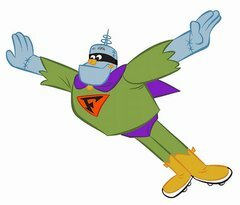 There would seem to be little doubt that the Frankenstein Jr. / Buzz Conroy relationship was inspired at least in some part by Gigantor, the famous space-age robot who was under the command of Jimmy Sparks, but hearing Ted Cassidy’s voice come booming out of Frankie made it rather easy to dismiss the derivative nature of the premise. As for the Impossibles, I remain mystified as to why a series about a rock band who doubled as superheroes neither lasted very long nor made any sort of dent on the pop charts. Somebody at Hanna-Barbera really dropped the ball on that one, that’s all I can say. One cold, wet night three lost teens – Skip, April and Augie plus Elmo their dog – stumbled inside a spooky old house hoping to get warm. The dusty clock showed the wrong time, so these helpful kids reset the clock hands. A gong rang out, followed by a voice: It’s the Spirit of 1776, even, at your service! Much to their surprise was the friendly ghost Mudsy and his mischievous ghost cat Boo. Antics abound when this motley group hits the road, cracking cases and thwarting crooks, pirates, ghosts and all kinds of strange characters. 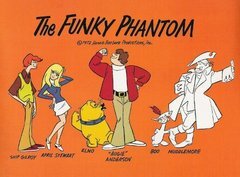 For my part, when I think of the Funky Phantom, I think of the fact that, when the amusement park Kings Dominion used to be Hanna-Barbera-themed, we also used to end up parking in the Funky Phantom lot. Also, I always remember that Micky Dolenz of the Monkees did one of the voices on the show (Skip). Funnily enough, though, it wasn’t until years later that I actually saw my first episode of the show, by which point I’d already long since associated it with fond memories of childhood, anyway. Having revisited it, it’s still a fun little show, following the same general formula as “Scooby-Doo,” but with the twist of doing the ghost-hunting with an actual ghost.